I was sifting through old NBA draft picks online (such is the life I lead) when I stumbled upon something rather interesting. We all know the 2003 draft, which featured LeBron James, Carmelo Anthony, Dwyane Wade and Chris Bosh, was the most dominant since the Olajuwon, Jordan and Barkley draft of 1984 but let’s take a closer look at the lottery picks since 1994 and see how many of them are still playing in the league. Again, we all know what happened in 2003 but it’s the 1995 lottery I’d like to talk about. Does it surprise anyone that Stackhouse (38), Wallace (38), Garnett (36) and Thomas (40) are still contributing quality minutes at their ages or that all of them are on playoff teams? All four are averaging at least ten minutes a game with Garnett, who may have the highest metabolism known to man, leading the lot with 30 MPG. I guess what I’d like to know is, what was in the bottled water at the 1995 draft and is the fact that so many veterans are still logging minutes more a testament to their stamina or rather the lack of young talent in the league. I get that championship teams need veteran leadership but what Sheed, KG and Stack are providing goes far beyond that. 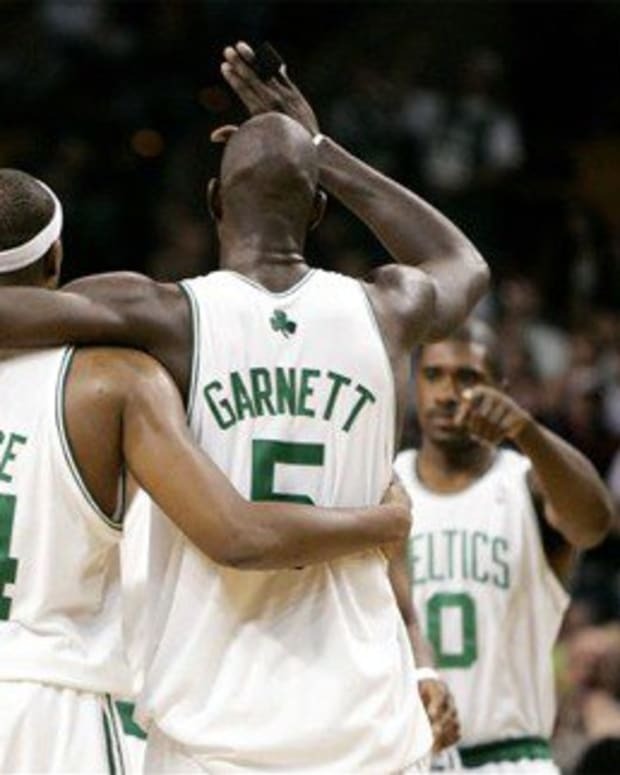 Garnett is Boston’s emotional leader, averaging 15 and 7. Sheed’s averaging seven points per game for the Knicks, which you know includes a timely three-pointer and some healthy trash-talking to psych out an opponent. Stackhouse is coming off the Brooklyn bench to average seven points a game and what team chasing a championship wouldn’t want Kurt Thomas taking up invaluable space in the paint. Maybe we shouldn’t be so surprised that these four ’95 classmen are still putting in the time. It gives hope to all of us old guys. But can you imagine a draft class 17 years from now with four guys like these giving it their all? For those keeping track at home, Garnett, Stack, Sheed and Thomas have combined for 66,000 points, 31,000 rebounds and over 140,000 minutes played! Not a single one of them has averaged less than 55 games per season over their careers with KG averaging an amazing 75 games per season over his 17 year career. I’ve written recently that this is a down year for the NBA. Some disagreed but I stand by my opinion. While the New York Knickerbockers remain a pleasant surprise and the Clippers holding the league’s best record, neither is a team that looks poised to win a championship. Nor does any other team in the NBA for that matter. Is that because of the lack of young talent in the league? How else could we explain the overload of 35-plusses still huffing it up and down the court? Let’s take this argument one step further. If you include Kobe from the ’96 draft, Billups and Duncan from ’97, Pierce and Dirk from ’98 (and arguably Hamilton from ’99), no other active lottery pick has led their team to a championship, until of course 2003. Similarly, no player after 2003 has done so either. I ask you, sports fans, is the future of the league in good hands if seasoned vets are still schooling newbies? I’m not saying this current generation is void of talent. Blake, Rose, D-Will and Chris Paul are all fun to watch. I’m just saying they might have to wait until this current batch of veterans retires before they earn a championship of their own. Don’t mind me. I’m just complaining about Stephen A. Smith again. NBA Rumors: Celtics Kevin Garnett Considering Retirement? NBA Analysis: Is Nowitzki a Better All-Time Player than Garnett?